Decades after his assassination, Archbishop Óscar Romero continues to be an inspiration and model as families seek justice for the killings and disappearances of their loved ones during the civil war. Pastel by J. Puig Reixach; images courtesy of Wikipedia Commons. This month, we share stories garnered directly from migrants traveling north in the caravan as well as undocumented U.S. residents recently deported to Mexico. In addition, we include an article about the pursuit of long overdue justice for the murders and disappearances carried out during the Salvadoran civil war. Caravan Faces and Stories of the Caravan: The migrants crossing Mexico in north-bound caravans are fleeing one of the most violent regions of the world and traveling together for safety and companionship along the road. Yet though they share a common nationality and current circumstance, each person has a particular story—about gang threats or discrimination or abject poverty. Here, at a shelter in Guatemala, several migrants share their accounts of what drove them to leave their homes for the uncertainty—and hope—of a new life in another country: https://www.nytimes.com/2018/10/18/world/americas/honduras-migrant-caravan-voices.html. The Deportation Experience: As the Trump administration has accelerated deportations and broadened their efforts to include those with no criminal offenses, more people are finding themselves ripped from their homes and families in the U.S., and destitute in unfamiliar cities. This article covers the situation from a shelter in Tijuana and includes interviews with several deportees staying there: https://www.kqed.org/news/11695081/dispatches-from-tijuana-u-s-immigration-policy-through-the-lives-of-deportees. Justice in El Salvador: During El Salvador’s civil war, which began in 1980, 75,000 civilians were killed, largely by the U.S.-backed national military. An amnesty law passed immediately afterwards ensured effective exoneration for the alleged war criminals and no justice for the families of the murdered and disappeared. 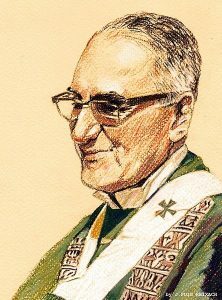 Since the law was overturned in 2016, there has been a resurgence of attention and activism about finally claiming justice, with the recently canonized Archbishop Óscar Romero (killed in 1980 amidst his outspoken criticism of the government) as a touchstone and patron saint. Read more about these developments here: https://www.theguardian.com/world/2018/oct/14/el-salvador-oscar-romero-civil-war-saint-justice.